Organic soaps with an island vibe. The different scents and colors of the soaps make up a rainbow of ways to remember the Islands. Wouldn’t it be nice to take home one of those sky-cleansing Turks & Caicos rainbows to remember your visit? You can if you buy all five types of soap from the Lucayan Soap Co. Sandra Walkin, the engine behind this Providenciales-based business, launched the company in 2014 and has developed a line of all-natural, vegan, palm-free soaps. Their different scents and colours make up a rainbow of ways to remember the clean air and local flora of the Islands. Sandra, a native of Austria, has been a part of the Turks & Caicos for eight years after marrying Bradley Walkin. Educated as a medical technician, she became interested making soaps through the influence of a cousin. An additional impetus was her first child: While visiting Austria with her baby, she tried a baby cream on herself and was unhappy with its harshness. She began experimenting with supplies, determined to make something gentle and all-natural, and originally launched her company as a venue for baby lotions, creams and soaps. Launching a TCI business is never easy, and the same was true for Sandra. She discovered that baby products were perhaps too much of a niche and difficult to market. Around the same time, she had an unexpected business break. A difficult pregnancy for her second child kept her away from the country for awhile, but also gave her time to re-think things. That is when she decided to focus on soaps, carrying over only her Turkoise Waters soaps into a new line. Lucayan Soap Co. currently offers five varieties. 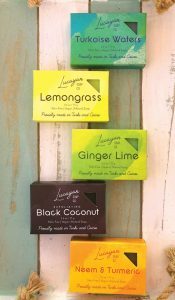 After more experimenting and production, Lucayan Soap Co. now offers five soaps: Ginger Lime, Lemongrass, Neem & Turmeric, Black Coconut and the original Turkoise Waters. Each has a distinctive scent and colour. (See sidebar.) The soaps are very appealing as gifts, representing an all-natural product made in the Turks & Caicos that can easily be carried home for one’s self and others. Much of Sandra’s initial investment was in equipment and supplies. Although the soaps make reference to plants grown in the Islands, she needed essential oils for soap, not the herbs themselves, and those are not available locally. Also, olive oil, shea butter and sodium hydroxide (lye) are essential ingredients that must be imported. 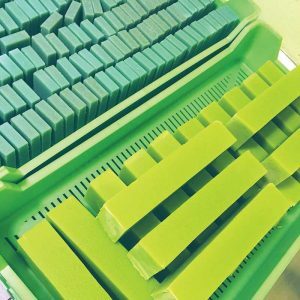 These block molds make about 200 soap blocks. Equipment for mixing the soap batter was also an investment. For the larger batches of her business plan, not just a small-scale DIY operation, Sandra needs a large bucket or pot that is stainless steel or otherwise food-grade, a power drill with a stainless steel mixer attachment, big block molds that will make about 200 soaps each (35 pounds of soap per mold), and grid cutters that will cut blocks and slices for the final soaps. While most of the efforts and expenses were all hers (she orders olive oil by the drum! ), Sandra notes that both the Centre for Entrepreneurial Development and Invest TCI have been extremely helpful to the Lucayan Soap Co. She was recently approved for a cash grant from the latter and receives a duty concession. She hopes to soon be able to order a stainless steel mixing pot that will be able to tip and pour the soap mixture into the molds. Also coming soon is the ability of the company to give back to the country, when production is developed enough that she can employ help. Sandra’s measured, step-by-step approach to “getting it right” applies to the marketing of Lucayan Soap Co., too. Its website, www.lucayansoapco.com, includes an online shop, and the company has presences on both Instagram and Facebook. Locally, the soaps are available at Flavors of the Turks and Caicos (FOTTAC), the boutique at Windsong Resort, and the Making Waves art studio at Ocean Club Plaza. Sandra continues to make the rounds of Providenciales shops looking for other places to sell soap. Shops determine their own prices, but online each soap costs $9 US. Gift sets and baskets are planned for the future. She admits that starting Lucayan Soap Co. has been a lot of work, but it has been work that she enjoys and Sandra believes that her growing business will find its place in the Islands. You might even say that Lucayan Soap Co. is poised to really clean up here! 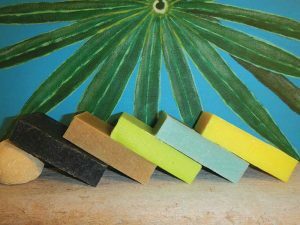 The colourful, attractive packaging of each Lucayan soap features a list of its all-natural ingredients, but what are all these, and what are the differences among the soaps? Fat and lye are the major starting points for any soap, but the key for a good soap is selecting ingredients that will help the skin instead of simply scraping or burning it clean. That’s where Lucayan Soap Co. excels. Each of the five soaps includes a basic formula that features olive oil, water, coconut oil, shea butter, sodium hydroxide (lye), castor seed oil and sodium lactate. Some contain mica. All are free of palm oil, notorious for its environmental damage. After the basic ingredients, the Lucayan soaps get their own specializations. TURKOISE WATERS, the original Lucayan soap, has a fragrance that is sea-salty fresh. It is also the colour that draws so many visitors to the Turks & Caicos Islands. GINGER LIME has the essential oils of both island ingredients, offering a citrus pep and the soothing qualities of ginger. LEMONGRASS includes the essential oil of what is known in the Islands as fevergrass, plus litsea essential oil. Here, fevergrass tea is often given as a soothing, cooling bush medicine. The scent of the soap is just as calming, and the soap is gentle on the skin. NEEM & TURMERIC is a tiny bit more medicinal in scent, but not so much that you’ll smell like a walking hospital. While Sandra Walkin dislikes making any medical claims for her products, a cruise through the Internet uncovers all the benefits of neem oil, neem leaf powder and ground turmeric, all ingredients in this soap: vitamin E, carotenoids, oleic acid, inflammatory properties and a compound called azadirachtin, which is an insect repellent. The soap also includes essential oils of peppermint, lavender and eucalyptus. BLACK COCONUT smells almost good enough to eat, but don’t! This is an exfoliating soap, containing charcoal made from coconut shells and ground raw coconut shell. Balancing that is coconut milk. Despite all that, its scent is clean, not sweet: You won’t think you’re bathing in a pina colada!